By replacing the point, dimensions are returned to those of a new product. Operation time can be shortened since you can replace by yourself. 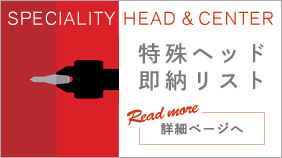 There are many kinds of standard product center head. 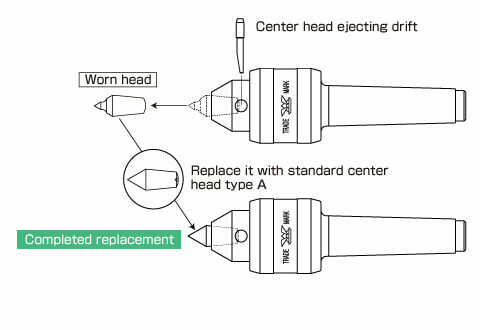 If you have a replacement type rotating center many kinds of work can be handled by changing the center head. 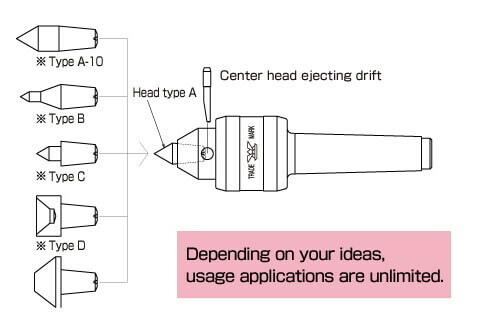 With head type A, the turning tool interferes but with head type A-10 there is no interference. 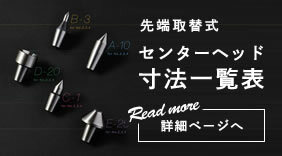 With head type B or C, there is no turning tool interference for thin work pieces. With head type D processing is possible even without a center hole. With head type E there is no turning tool interference for pipe.